This evening my Mom, Diaperbutt & I walked downtown to go for supper. Chatting merrily our cheerfulness was interrupted by the appearance of a dead little baby bird on the sidewalk. It must have fallen out of a nest in the eaves of one of the storefronts. Poor featherless little guy. I felt compelled to do something but surrounded by nothing by pavement in every direction I did not know what & am ashamed to admit I walked by. And now I keep thinking about that little yellow beak silently open. The circle of life can be so harsh. If you see Diaperbutt & I on the street & I’m holding him upside down while he screams in my face & I scream in his, keep walking & save your dirty looks. He thinks it’s hilarious – it’s a game we play. Note to self: this might be a game better saved for private. Last night I had a conference call for Guiding Mosaic 2010 to get updates from the whole program team & to beg people if they know lifeguards to send them my way (do you know any lifeguards who wanna come play for 2 weeks?). Shock of all shocks Diaperbutt crawled onto my lap & fell asleep 5 minutes before the call – almost 2 hours earlier than usual!!! It seemed the night was off to a fabulous start. Ah, but starts do not always indicate how well the trip will go & that was definitely the case last night. Bubbo is a big fat lover but he's also an instigator, quietly riling up everyone around him. 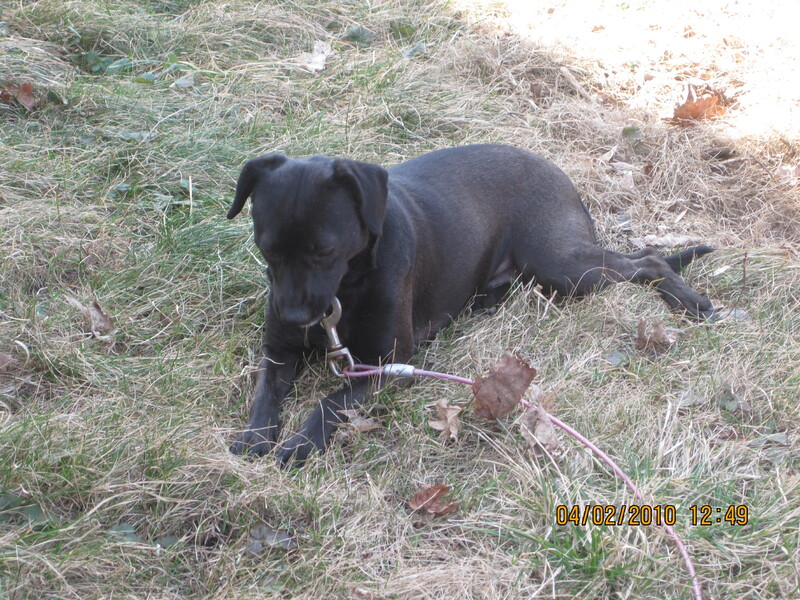 12:30 – Grumpy Bear went to leave his office & stepped on the cat in the process – she screamed & bit him in protest causing him to yell out in pain which spooked the little black dog who ran through the house barking causing me to jump up & try to hush her. Not surprisingly Diaperbutt finished the chain reaction by waking up crying. It took me an hour to get him settled again. 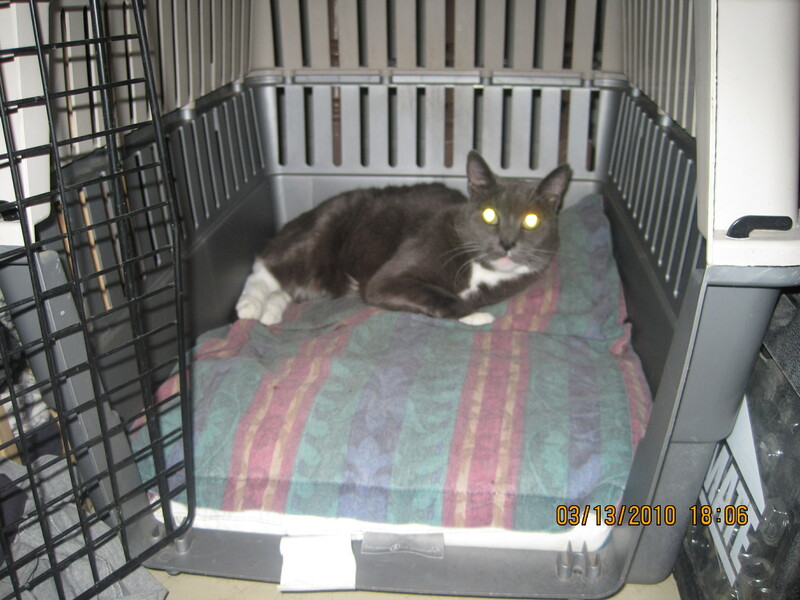 Our old girl knows how to make herself comfortable (here she is taking over the dog's kennel) but she will protest LOUDLY if anyone interferes with her once she is comfortable. 3:00 am – some critter got into our garage, knocking over the garbage & greatly agitating the big girl. I had to get out of bed & go downstairs & look out the window with her to reassure her they were gone & no real concern to start with. Shockingly Diaperbutt did not wake up but when the big girl barks in that particular way it always gets my heart rate going ’cause it is her “something is actually happening” bark & sometimes she’s actually right. It’s not easy to fall back asleep after the little adrenaline rush. 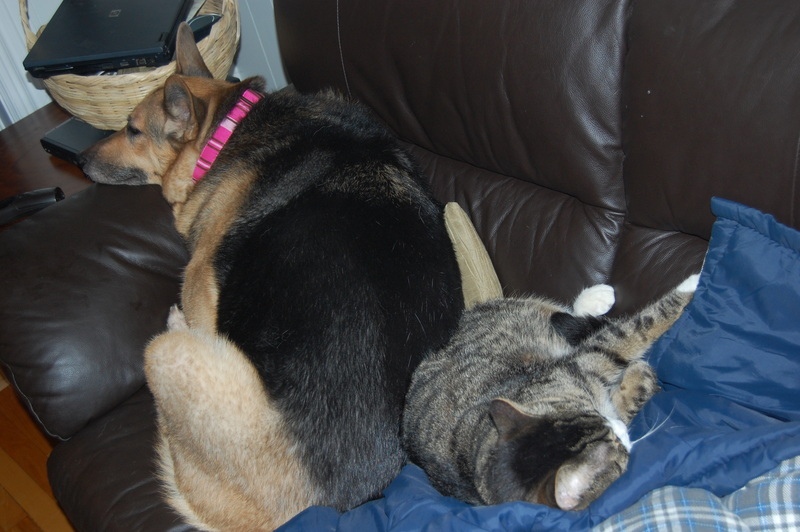 The big girl can be really comforting to have around but she is also guilty of false alarms. 5:00 am & the cats get into a tousle (we really need to start throwing the fat one outside at night – he’s just too full of piss & vinegar to be in the house) resulting in a lot of hissing & screeching & thumping (I thought cats were supposed to be graceful?). 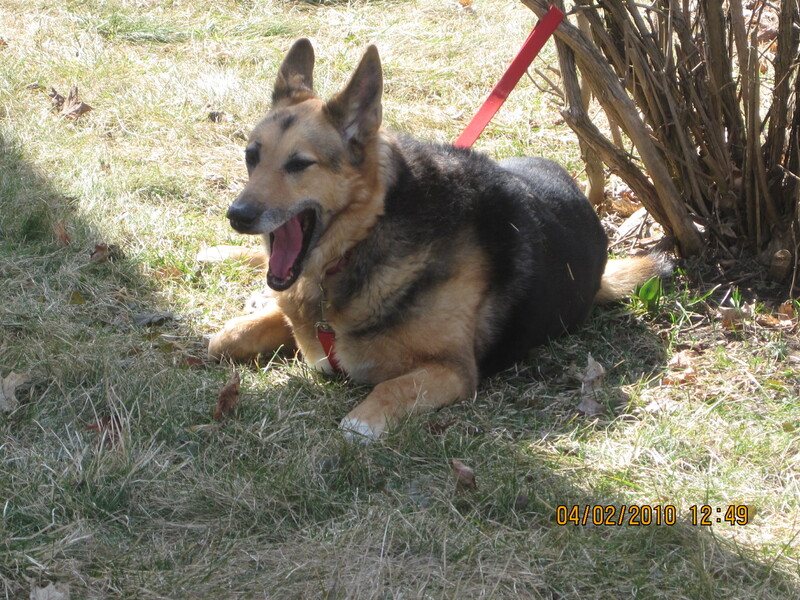 Macie felt she needed to let us know & added her two cents in the form of yelping little barks. Not surprisingly Diaperbutt woke up crying – after an hour I give up & get up as he is obviously not going back to sleep. She looks cute but that's just her cover for a whole lot of BAD! I love our critters but there are times I question my own sanity for having them in the house! Our stove came with our house & was in rough condition then. As a result I have always disliked it. It’s pretty rough looking & a bit battered but I just could not justify replacing it when really all it’s faults were cosmetic – the darn thing works perfectly. 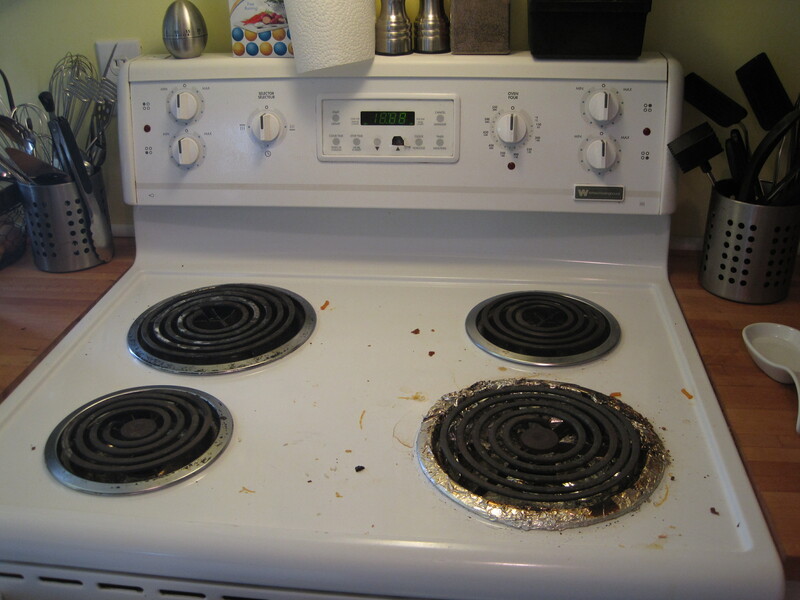 This stove top has seen better days - unfortunately they were before I owned it. 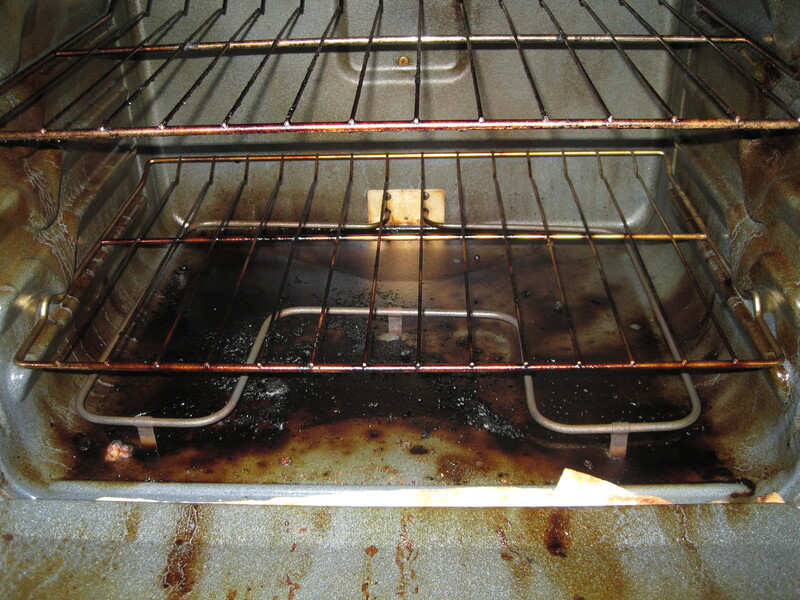 Ok – yeah, part of the problem was just built up grime – oh how I hate to clean the oven! OY! I swear we have cleaned it before! 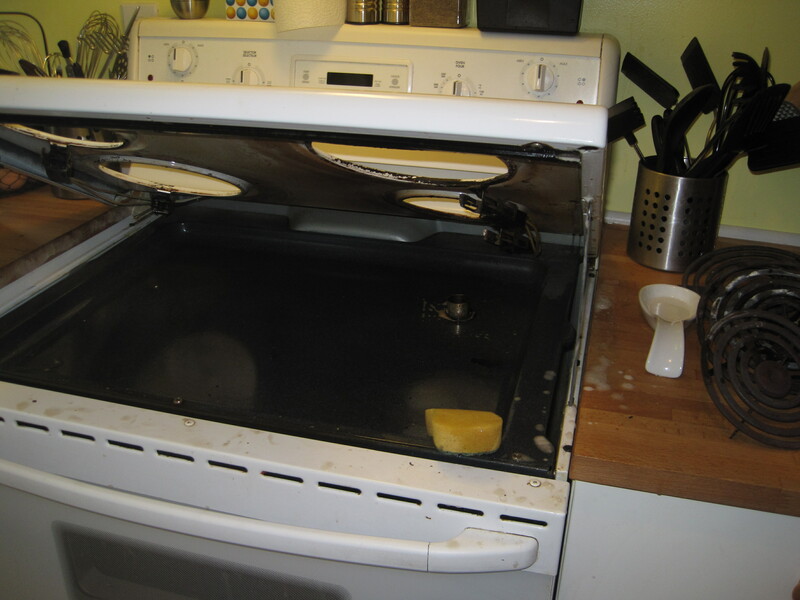 To be fair a good chunk of this was from our renters who did not clean the oven before they moved out. 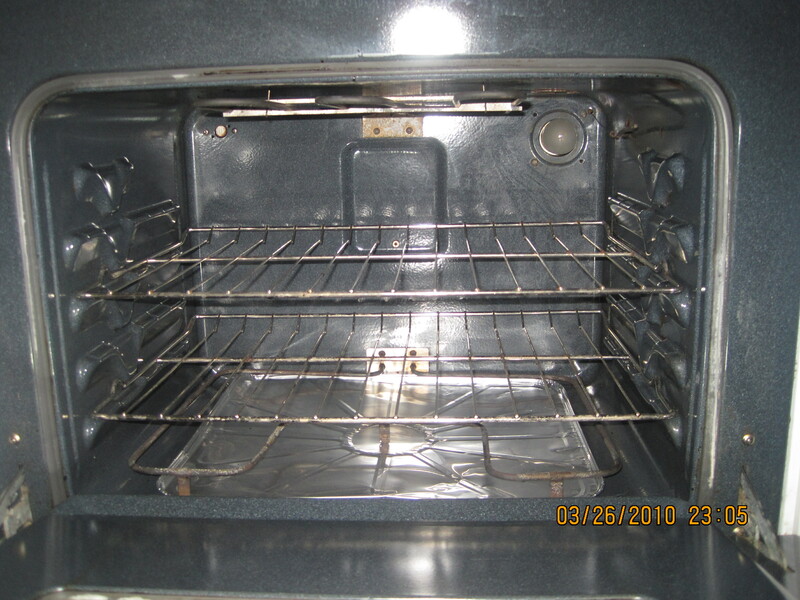 Oh how oven cleaner makes me lungs burn - next time I am definitely going to try something different. 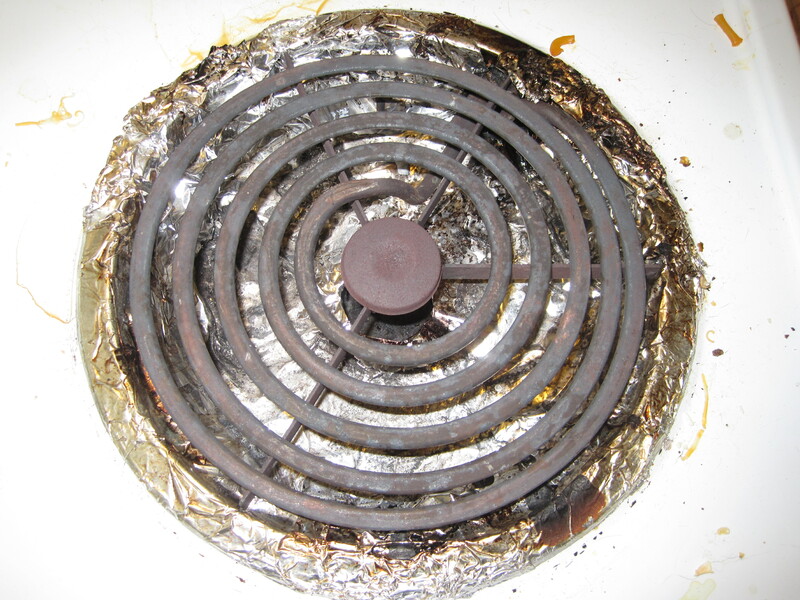 But the rings around/under the burners were beyond cleaning – I did try, several times, to wash them by hand & in the dishwasher but the finish on them was just destroyed. Plain & simple they needed to replaced – unfortunately it took about 4 different stores before I found one that carried four of the same variety – everywhere seemed to only have 2 or 3 in stock. I don't know that wrapping the ruined metal in tinfoil helped the overall appearance or functionality. Oh - shiny! Unfortunately I haven't been able to find new buttons for the center of the burner - the old ones were so blackened I figured it looked better without them at all. 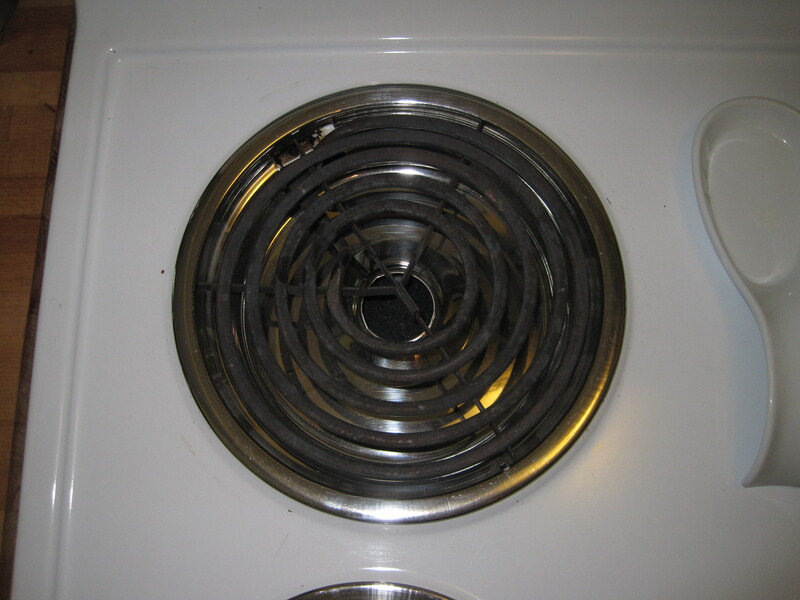 I gambled when standing in Canadian Tire & bought the one piece ring/bowl but they don't sit flush with the stove like the old two piece ones did. As I didn't realize this until after I had destroyed the packaging removing it we will now live with this slight imperfection. Then there were all the little repairs that needed to be done that had been bothering me for so long. Replacing the light bulb in the oven, levelling the darn thing (the levelling foot is missing so I used a folded up piece of cardboard under the back foot), reattaching the drawer slide to the drawer front (ok – I actually did some damage to the finish in doing this repair but the drawer is finally functional again!) & putting a dial thermometer inside so I could verify the temperature is correct (shockingly it seems to be right on every time). Unfortunately there is nothing I can do about the tear on the control panel cover (how the heck did that even happen?!) & one day this summer I am going to take the drawer outside & spray paint the inside of it as the metal is rusting some so despite my thorough cleaning it looks rather dingy. After all the scrubbing involved to get this so clean I vowed not only to be more careful with messy dishes in the future I also put in place a disposable oven tray in the bottom to hopefully catch the worst of future messes. 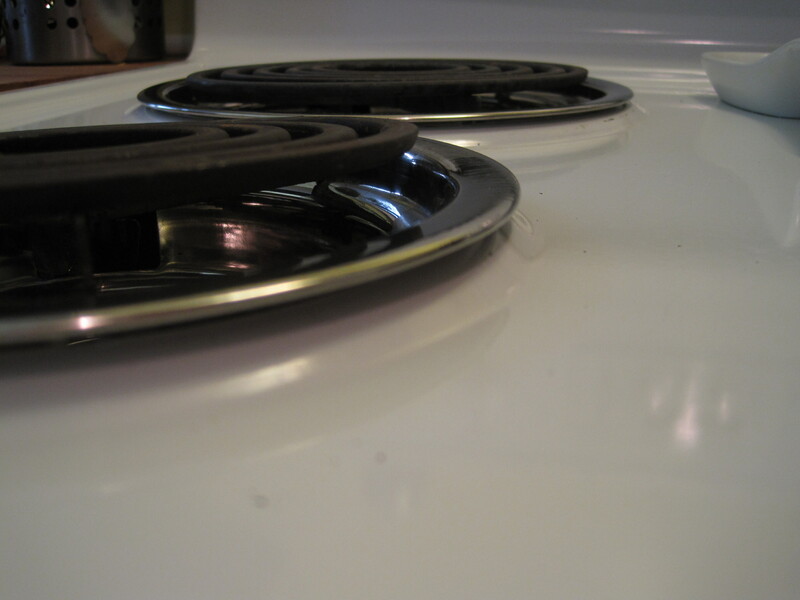 Best things I discovered while cleaning the stove - the oven racks fit in the dishwasher & the whole top of the stove lifts up making cleaning underneath much easier. 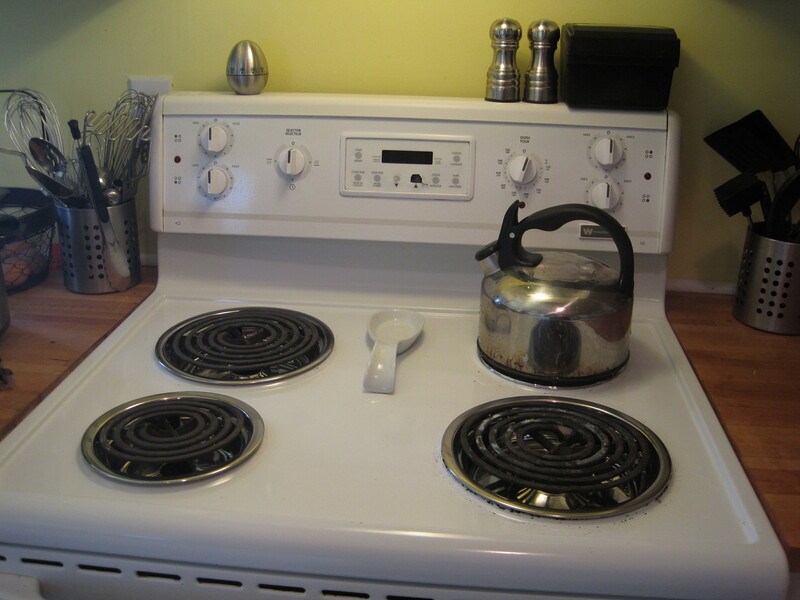 So, just like the toilet refurbishment, with a little bit of money (I spent under $40), some elbow grease & a chunk of time (about 2 hours in total – that oven was DIRTY) we have a stove that is pretty much like new. Makes it much easier to tolerate the scratches in the finish when it’s all shiny & working perfectly! Shiny & (almost like) new! This is what my laneway looks like tonight. 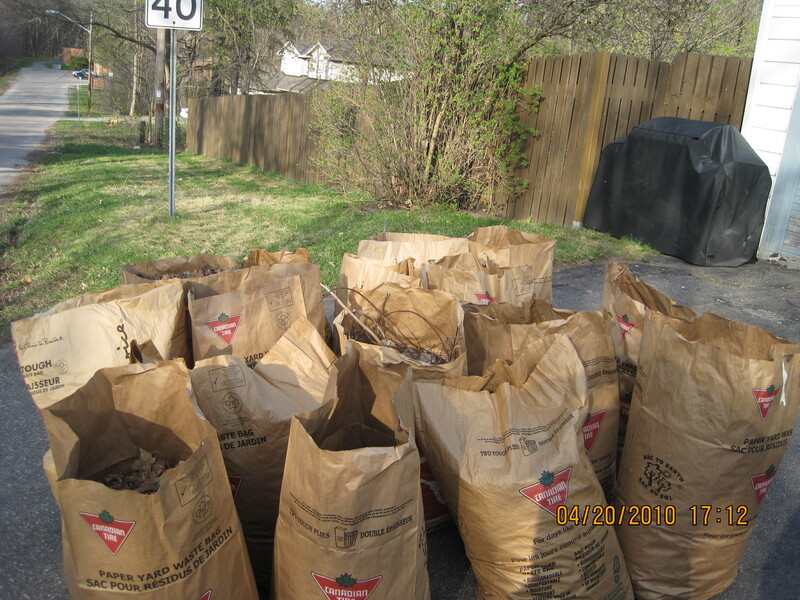 It took me a little over two weeks but I met my goal of getting the entire yard raked & bagged before yard waste pick up day (tomorrow!). I have never before been done (or started!) before the one & only pick up day (ok – there is one other one in November). I guessed it would be 20 bags but ended up only needing 17. And I even managed to do the first mow of the entire yard as well. Sounds silly but we tend to mow in chunks & there have been years when some chunks rarely get touched (like the backyard no one can see in!). Bonus: my Mom came over this morning with her truck on her way to do a dump run for herself & took our pile of dump bound junk, including the old bbq that tackled Diaperbutt on the weekend! Slowly but surely our yard is becoming rather hospitable. It’s raining. I’m feeling crampy & achey & blah. It was most definitely one of those days that would be best spent curled up in bed or in front of a hot fire with a good book. Diaperbutt does not feel the same. He thinks the rain would be splendid to play & splash in.One of the dogs feels the same way. Lucky for me most days we are more in sync with one another. Unlucky for him (& the dog) my need to stay warm & dry today outweighs his desire to get wet & cold. Maybe tomorrow my body will feel more up to spending some chilly time in the rain. Ok, so after spending 4.5 hours refurbishing the toilet we have been unhappy with the results. At some point in time “someone” before us must have done their own toilet repair. We think it might be whomever tiled the floor in the bathroom as the tile was a large part of the problem. 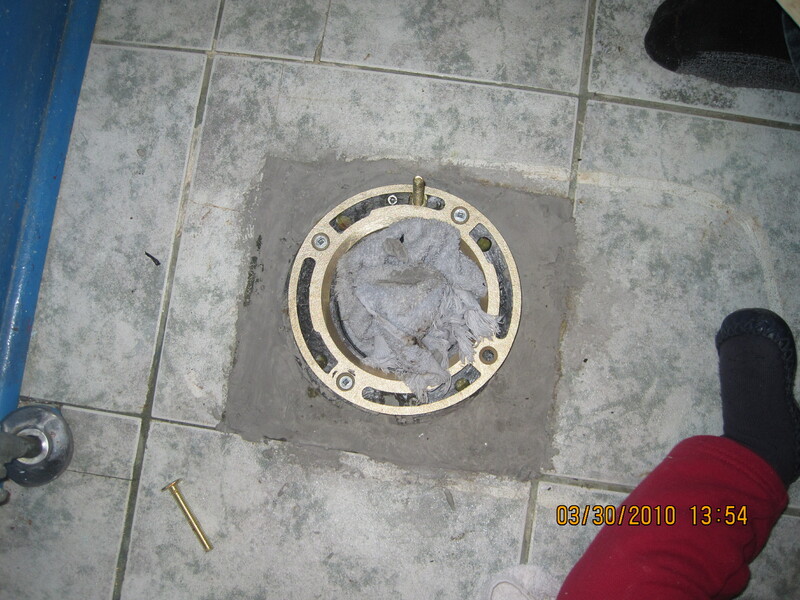 Whomever tiled the floor did not complete the tile all the way to the flange, but also did not fill in the whole area between the flange & the tile with cement leaving an area where the floor was a full 1/2" lower than the tile & 3/4" lower than the flange. Now we had seen this when we did the repair back in January but we were hoping it was going to be okay the way we had it. 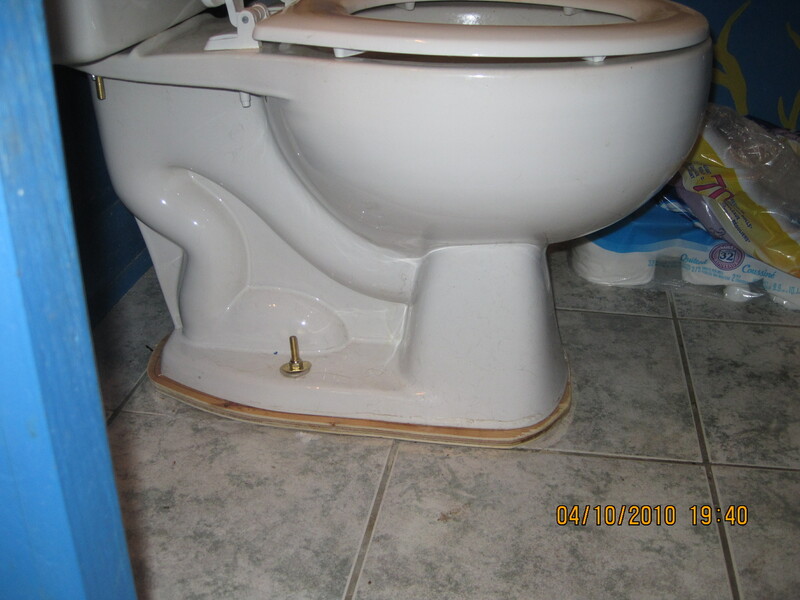 The big problem with the state of the floor was that the weight of the toilet (& therefore anyone sitting on the toilet) was resting primarily on the flange, instead of on the floor like it should be. Ever since we did the refurb (& before really but at that point we didn’t know why) the toilet would shift a little every time someone sat on it, but we couldn’t seem to get it to tighten down enough to stop that. To make matters worse “someone” along the way had also put some sort of plastic flange repair kit on top of the flange that had an unusual arrangement for the bolts allowing them to slide out of place really easily even when you thought they were tightened down. So we finally decided we needed to take the toilet off again & revisit our repair. With the toilet off & in the hall, my Mom, Grumpy Bear, Diaperbutt & I spent sometime evaluating our options. I will admit I cried with frustration – some projects you just do not want to have to repeatedly revisit. 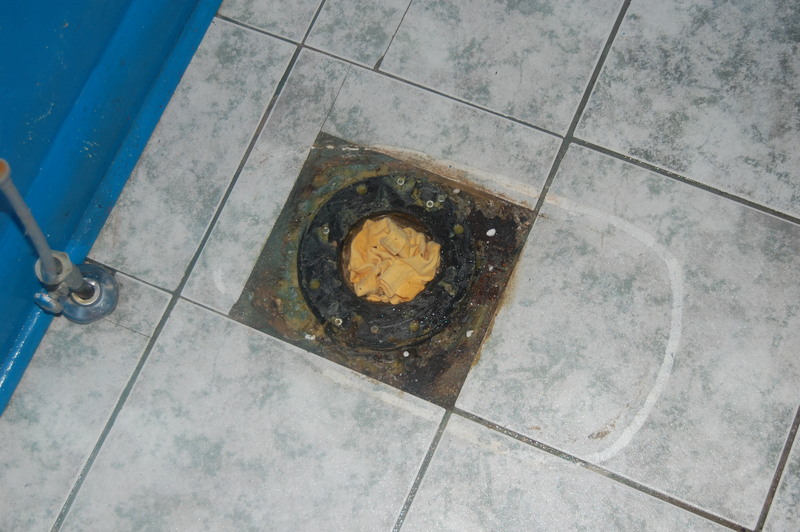 The floorboards are slightly soft, the flange was not very well supported & with the state of the tile there was no way to secure the toilet properly to the floor. 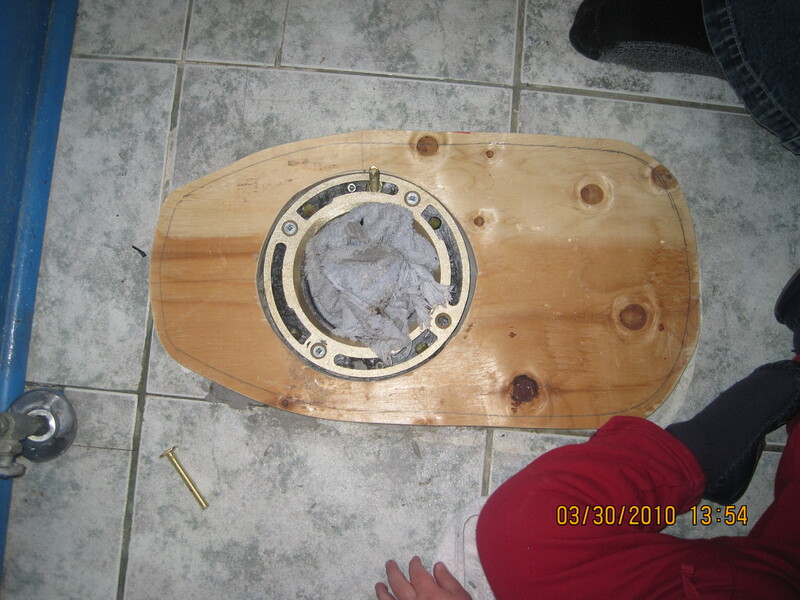 The first steps for the repair were to install a proper a flange repair piece (that's the brass ring you see) so that we would be able to more adequately be able to bolt down the toilet. And then we used two applications of quick set cement to fill in the gap made by the tiles & to give the flange more support. The problem with the first steps of our repair is they made the flange even higher above the tile & really the flange (& our ancient pipe beneath it) should not be supporting any weight. After some scrounging in the garage we found a scrap piece of plywood that was the right thickness to bring the floor level with the flange. Because there is some wiggle room when you install a toilet we cut the plywood just slightly larger than the toilet base so there was no chance of it not lining up perfectly (going for perfect is a high order in an old house!). It is most definitely due to Grumpy Bear’s attention to detail that this is cut so nicely. 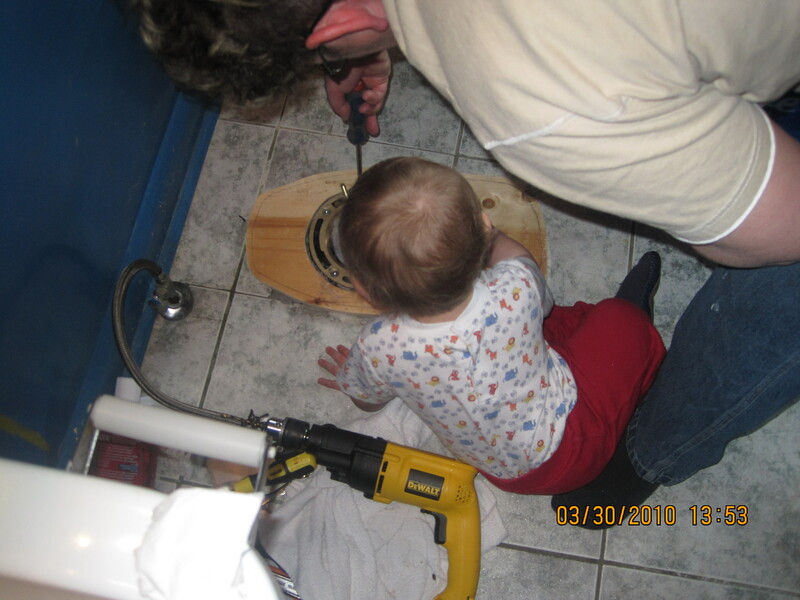 Diaperbutt was pretty sure his help was needed. It was pretty cute to see him climb over Mom's leg & get himself settled right between her legs with his screwdriver already for action. It’s not the prettiest fix ever but it is now really solid & we no longer worry we are slowly rotting the floor with a slow, invisible leak or risking breaking off the flange (an expensive repair outside of our abilities). One day I will paint the plywood with a high gloss white & I think that will make it a lot less obvious. I suppose ideally we would have painted it before we replaced the toilet but as we have only one toilet in our house having it out of commission for 3.5 hours was pretty much our limit. Now if I could just get the chain on the new flap valve adjusted properly so it stops catching after the occasional flush making me have to run back up the stairs to wiggle the handle. Hmmmm… then again running stairs is good exercise.